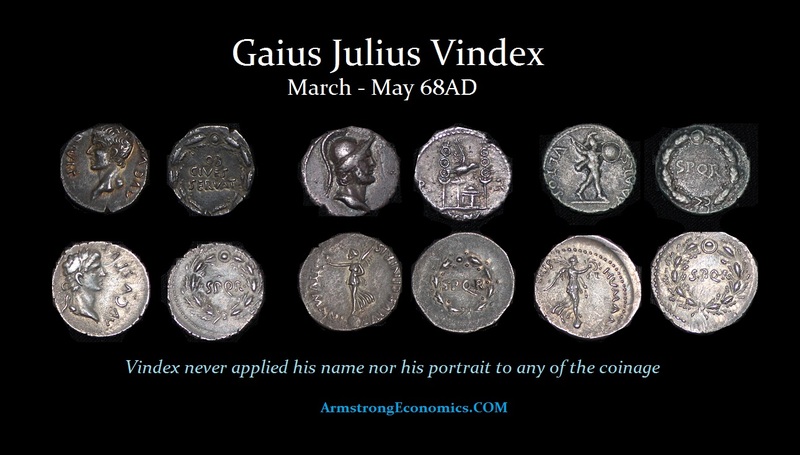 Gaius Julius Vindex, descended from the kings of Aquitania and the son of a Roman senator, was governor of Gallia Lugdunenis at the time he raised the standards of revolt against Nero in March 68AD as a reaction to Nero’s tax policy. 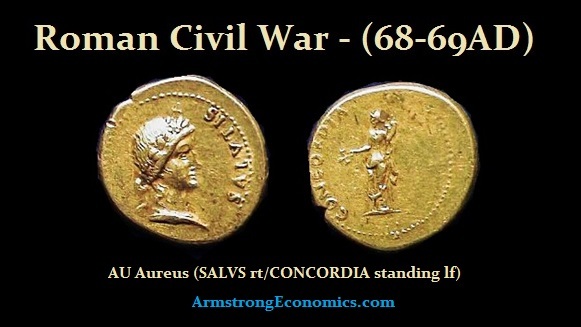 Having no Roman troops under his command, Vindex appealed to other provincial governors to support his uprising, an invitation which was answered only by Servius Sulpicius Galba in Spain (Tarraconensis). 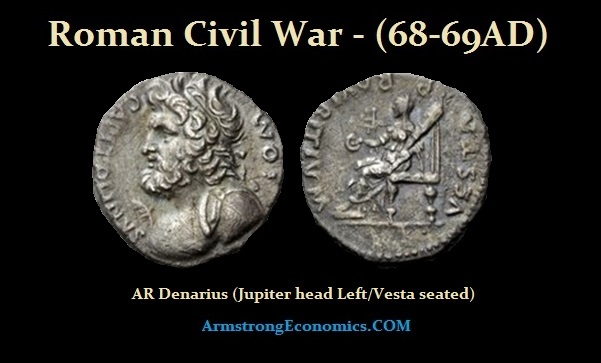 Even his own provincial capital of Lugdunum refused to join his cause, though Vienna (modern Vienne) in Narbonensis did side with him and was the probable place of mintage of the coins struck during the period of his revolt (none of which bear his name or portrait). In May the rebellion of Vindex was crushed when his army was defeated at Vesontio by L. Verginius Rufus, governor of Upper Germany. 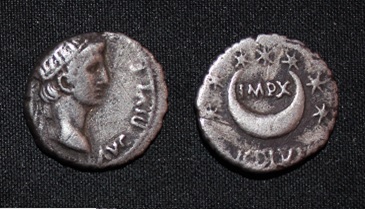 Just a few weeks later Nero committed suicide and soon afterwards Galba was formally recognized as emperor by the Roman Senate. 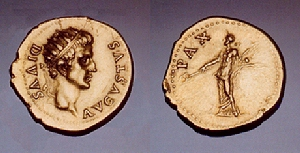 Vindex’s coinage did not display his portrait in a direct attempt to resurrect the old Republic before Augustus (27BC-14AD). Despite the fact that Vindex was defeated, popularity was growing for a rebellion and thus Galba was looked upon as a favorite. Sensing this, Nero fled Rome. Shortly after, the Senate decided to oust Nero by declaring him a public enemy, thus spurring on Nero’s suicide. 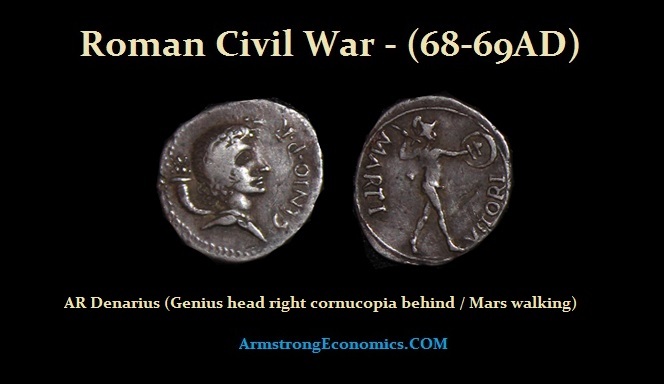 His death saw the arrival of the first civil war since the defeat of Marc Antony in 30 BC. 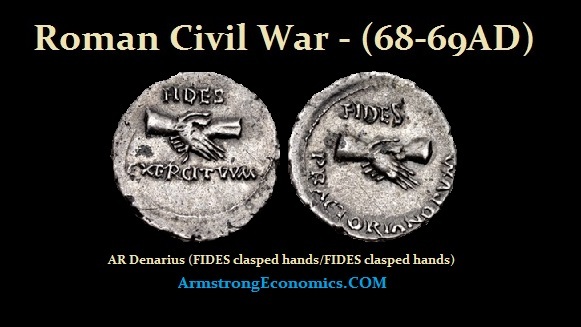 Consequently, between June 68 AD and December 69 AD, Rome witnessed a period of anarchy and a series of quick successions. Four Emperors ruled in this period: Galba, Otho, Vitellius, and Vespasian, with the latter securing the imperial throne and founding the Flavian dynasty. 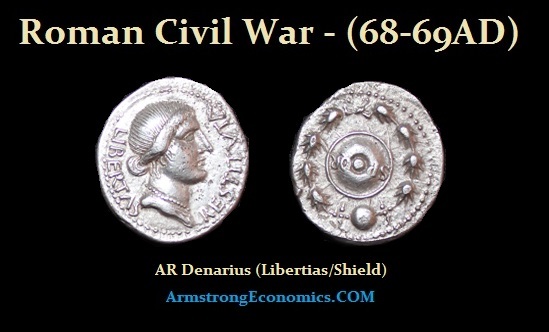 Therefore, the Civil War begins with this series of coins that were struck without the contemporary portrait of an emperor as had been the case since the time of Augustus during the birth of the Imperial Era. 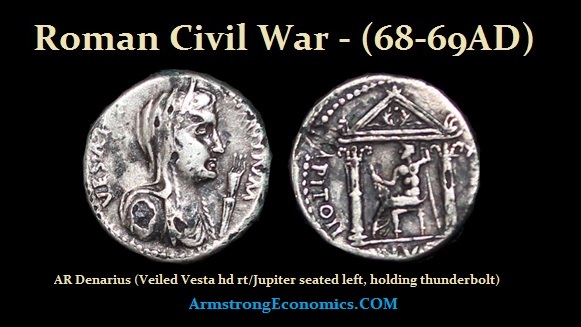 Instead, we find various types being issued with an assortment of Roman gods including that of the Divine Augustus.